"Like Us" on our Facebook page! The cool and colorful days of autumn approach and we invite you to this annual pilgrimage to one of our most sacred and cultural spaces. Visit your family, friends and neighbors, meet new residents and greet visiting tourists from afar. The beautiful grounds and pedestrian friendly avenues are sure to be a healthy, entertaining, educational and reflective afternoon. This Maple Hill Cemetery event has grown to be one of the largest living history strolls in the nation, with over 75 costumed characters, traditional music, special exhibits, an expanded antique auto display, and student scavenger hunts. There will be at least a dozen new characters featured this year. Not all are buried in Maple Hill, but they are essential in accurately reflecting the history of Huntsville. Some of the music will accompany character portrayals. Exhibits will highlight fascinating cemetery history and recent restoration projects. Look for the antique autos in a chronological procession in the southern end of the cemetery. Water and rest facilities will be provided, as well as a parking shuttle from the downtown courthouse square from 1-5 p.m. The metered parking spaces and municipal garages downtown are free to the public on Sunday! If you live nearby, we encourage you to walk to the Stroll. If parking in the cemetery, please the use the McClung entrance located on the southern border. If parking on side streets nearby, please exercise caution and courtesy with our good neighbors. Please remember that pets are prohibited, and for your safety, do not lean, sit or stand on the monuments. The Stroll is a free event for all ages, but we welcome donations. 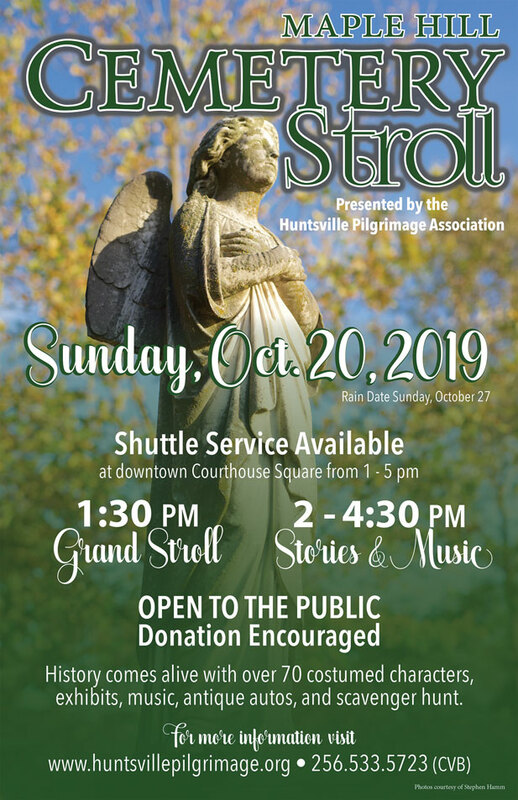 The Huntsville Pilgrimage Association sponsors this event and all donations are used to preserve and restore the historic sections of Maple Hill Cemetery. The toll of nearly two centuries of vandalism, human error, damaging weather and the natural aging process, presents a constant and never ending endeavor. With your support, the Huntsville Pilgrimage Association has provided nearly $400,000 for the restoration of over 1650 monuments and decorative metal fences. The designation of Maple Hill Cemetery in the National Register of Historic Places reflects your commitment in protecting this jewel in Huntsville’s cultural treasure chest. the graves of many historic and political figures. McClung Avenue, it includes more than 80,000 graves. to the annual Cemetery Stroll and your participation in the Angels of Maple Hill Cemetery. Early in 1984, a group of interested persons met to consider organizing a Huntsville Pilgrimage Association. This organization, if formed, should be of such a nature as to be of interest to local people, as well as to groups from around the state and adjoining states. To discuss the feasibility of such an undertaking, the group asked the Madison County Tourism Director and the Director of the Huntsville Convention and Visitors Bureau to meet with them to lend their expertise to the group’s thinking. A productive discussion took place and it was decided that due to the early history of this area, the number of historic homes available for touring, and the many other attractions here, Huntsville should be an ideal location for such an endeavor. Therefore, on June 25, 1984, an organization was formed and plans began for the first pilgrimage to take place April 13-14, 1985. Early in the plans of the organization it was suggested that the group needed a project for future consideration and the one decided upon was the “historic” section of Maple Hill Cemetery, which was badly in need of assistance. This has been a continuing project of the group, and over the years much progress has been accomplished. “A Stroll through the Cemetery” was eventually inaugurated, and it has grown through the years and proven to be quite popular with the city. During the second year of the Pilgrimage, the historic churches of Huntsville were added to the tour. The Weeden House was also added as a bonus, and a donation from the Association goes to the museum each year. Most recently, the Association initiated a membership program, the Angels of Maple Hill Cemetery, and began publishing a newsletter. Although many changes have been initiated since 1985, the Association feels it has met its goal each year in presenting historical facts to the public. The Association has been most fortunate to have wonderfully civic-minded homeowners so graciously open their homes for tours. The Association realizes that only with the cooperation of many can it present a living picture of history to the public.